During his greatest crisis in Tombstone, Wyatt Earp made one decision which 128 years later, has unlocked the correct location of where he really lived in Tombstone. A storm of life changing events encircled Wyatt Earp and his family as the year 1881 drew to a close. He, along with brothers Virgil and Morgan Earp, had survived the street fight now known as the gunfight near the O.K. Corral, and the latter two were recovering from their wounds. Two legal challenges over the bothers’ guilt in the fight ended with them being free men, but the trouble was far from over. On the night of December 28th assassins would nearly succeed in killing Virgil Earp, and he would forever lose the use of his left arm. As Wyatt and a posse searched for Virgil’s attackers, expenses mounted. Promised funds did not materialize at levels hoped for. Virgil was in bed recovering, and the Earps had less time to devote to money making enterprises like gambling, real estate, and mining speculation as their lives were more and more at risk. The combination of these events may have led Wyatt to borrow money during the very height of his troubles, a loan on his house that he did not pay back as agreed. Earlier this year I was contacted by an antique dealer who was selling a collection of personal papers and business documents that once belonged to E.B. Gage. (The Grand Central Mill paycheck featured on my Contention City page is from this collection.) Gage was a major player in Tombstone mining, and he provided (along with Jim Vizina) the second round of bail money for Doc Holliday and Wyatt Earp during the Spicer hearing which occurred in the wake of the gunfight. While discussing the purchase, the dealer mentioned to me that there was a newspaper clipping from the Tombstone Epitaph listing Wyatt Earp and his wife Mattie in some kind of lawsuit in Tombstone in 1884. But why would Wyatt and Mattie be involved in a lawsuit in Tombstone two years after having left town? Though Wyatt still had unlikely hopes of later returning to Tombstone and running for Sheriff in November of 1882, the wisdom of such a decision was at best questionable, following his vendetta ride. Would Gage have cut out this article as a memento considering his earlier support of and relationship with him? After buying the collection, I speculated that Gage was actually saving that clipping for what appeared on the reverse side: a report of the recent failure of the Hudson & Company Bank (formerly the Safford and Hudson Bank). Surviving Epitaphs, especially after 1882, are not plentiful. As providence would have it, the report of Wyatt’s lawsuit, saved in this clipping, would prove to be the catalyst to question where he had lived while in Tombstone. The amount and rate of interest Wyatt was being sued for was exactly the same as published previously for a loan that Wyatt had taken out on his home before leaving Tombstone. Wyatt left Tombstone in April, 1882. Their last months there were tenuous due to safety issues, so Wyatt and Virgil left their homes on Fremont Street joining other family members at the more secure Cosmopolitan Hotel, in the middle of town. Wells Fargo funds were deposited in the Hudson Bank for the use of the Earp posse, but the amount used by Wyatt for his posse remained modest. Records seem to indicate a $536.65 withdrawal by Wyatt. According to William Shillingberg, author of Tombstone A. T., Earp posse member, Charlie “O. C.” Smith, believed that Wyatt only accessed about $500.00, which corroborates the above figure. But the pursuit of Virgil’s shooters was not an inexpensive endeavor. Each posse member was supplied with a “horse, bridle, saddle, carbine, six-shooter, and rations.” In March E.B. Gage would again be asked to aid Wyatt financially. promised nursing care for injured members never materialized either, with Virgil's wife, Allie, shouldering this effort without any assistance from this organization. But the O.K. Corral gunfight did not impact only the Earps in a negative way. At the time of the gunfight, the Earps had supporters who held office locally. The Tombstone Nugget later branded these officials the “Earp ticket,” and many of them lost in the first election following the October shootout. On Wednesday, January 25, Wyatt and Morgan Earp, along with Doc Holliday and posse, left their camp near the Merimac Mine three miles outside of Tombstone, and headed to Charleston with warrants for Ike and Phin Clanton and Pony Deal. They searched Charleston in hopes of finding other cowboy adherents as well whom Wyatt believed responsible for or knowledgeable of Virgil's near -death shooting. They kicked down doors and stopped travelers on the roads in and out of Charleston. No arrests were made. Just over a week later, Wyatt changed course by offering Ike Clanton a truce, which was soundly dismissed by Clanton. Tensions continued to build between the cowboys and Earps. Even though the Earps had a reputation of pooling their resources, reduced family income, increased travel expenses, and problems with the funds at the Hudson Bank may have led Wyatt to make a difficult financial decision. The Earp brothers and those close to them could not have foreseen the turmoil of the next three months, even given the tension existing in Tombstone at that time. The preceding three months had been tumultuous; the following three months would be remarkable. Morgan Earp would fall to an assassin’s bullet on March 18th, and Wyatt would gun down three men in retribution the following week. As Wyatt Earp and his posse rode out of the Arizona Territory in early April, James Howard had to be wondering what this meant for his business deal. In 1882, $365.00 was a considerable sum. By the late spring of 1884, Howard filed suit, the report of which was published in the Tombstone Epitaph; the clipping survives in the Gage papers. The Epitaph lists Lots Three and Four of Block M as the property that Wyatt and Mattie collateralized to Howard for this loan. Virgil’s wife, Allie, shared information about the position of the Earp homes on Fremont Street. Note the location and distances between the homes of Wyatt and Mattie, and nearby Virgil and Allie: “Wyatt got a job as a shotgun messenger for Wells Fargo, so he and Mattie moved into a house of their own…Our house was next door to Wyatt and Mattie’s except for a vacant lot between.” This means that both Virgil’s and Wyatt’s houses were on the South side of Fremont Street. There were actually two lots between Virgil’s and Wyatt’s homes. Virgil and Allie occupied Lot One, while Wyatt and Mattie had Lots Four and Five. Given these lots were only 30 feet wide, it would be understandable that Allie would see a vacant piece of land in between two lots with homes on them as one lot instead of two. Otherwise, her description accurately fits the location of the Earp homes and is corroborated by the mortgage. See the 1881 city map by M. Kelleher, City Surveyor, below. The description of location within Wyatt’s mortgage, paired with Kelleher’s map, indicates that his and Mattie’s home occupied lots Three and Four. This is further corroborated by the 1882 Delinquent tax roll of Cochise County, courtesy of Kevin Pyles, Cochise County Archives, Bisbee Arizona. The mortgage describes the location of Wyatt and Mattie’s home as “The house and lot on Fremont Street situate[d] about one hundred feet (more or less) from the Southwest corner of Fremont Street…” The mortgage does not state the name of the cross street which is adjacent to lot one (Virgil’s property), but Kelleher’s map lists it as First Street. The measurement from the corner of First Street and Fremont to Lot Four (Wyatt’s lot) is 90 feet. The mortgage states that Wyatt and Mattie lived in the home located two lots away from Virgil’s property: (continuation of above quote) “…and westerly from the house and lot of Virgil Earp two lots intervening between the lot of hereby mortgaged and said house of Virgil Earp being the same premises heretofore occupied as a residence by said mortgagors.” Although cloudy with “legal-speak,” this last sentence does not refer to Virgil’s house as being occupied “by said mortgagors” because Wyatt and Mattie occupied their own house, and it would be illegal for Wyatt to collateralize his brother’s property without his written consent. Virgil’s house is mentioned as a landmark only, since lot numbers are not used in the mortgage. Wyatt and Mattie were actually “mortgagees,” not mortgagors. Click Image to see full Mortgage. 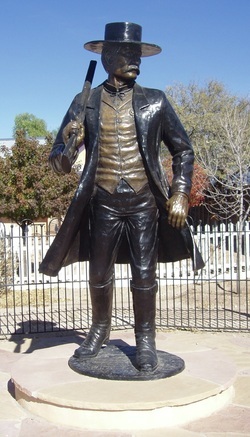 WHY WAS IT BELIEVED INCORRECTLY THAT WYATT'S HOUSE WAS ON THE NORTH SIDE OF FREMONT, WHERE THE STATUE OF WYATT IS TODAY? There is a long-repeated local story that Wyatt lived across Fremont Street from Virgil. Some of the roots of this claim may have begun in 1960, when Frank Waters, author of The Earp Brothers of Tombstone stated the following: “The moves were not entirely satisfactory to Allie, who had hoped to get away with Virgil to themselves. Their house was on the southeast corner of First and Fremont. Wyatt and Mattie lived on the northeast corner.” But “Tombstone Travesty,” Waters’ original manuscript on which his book was based, uses Allie’s quote as above, placing Wyatt’s house on the same side of Fremont Street. Another problem may be related to a Tombstone street map of the late 1960’s by John Gilchriese, which describes a house on the northeast corner of First and Fremont as having been owned by Wyatt Earp. Interestingly, he also lists the home on the southwest side of First and Fremont as being a Wyatt Earp residence until October 26, 1881. So regardless of current tradition, the mortgage with James Howard offers something conclusive - the only certain proof of a Wyatt and Mattie Earp residence. The mortgage was briefly cited in a prior publication, but its details were not brought to light, nor was the actual document published in its entirety, as the expense of doing so in book form is prohibitive. The mortgage remains a significant document in Earp research as to where Tombstone’s most famous ex-resident actually lived. The 1886 plat book of Tombstone shows the Earp brothers as being the owners of Lot 22 of Block 29 (see Kelleher map). The building now purported to be Wyatt’s home sits on Lot 21. Its parking lot occupies Lot 22. The Tombstone plat book does not address whether there was a structure on Lot 22 in 1886 or not. We do know that Wyatt’s father, Nicholas Porter (N. P.) Earp, was billed for taxes on Lots Four and Five in 1886. It is only my speculation that Wyatt’s father may have settled the lawsuit with Howard so as to keep those lots in the family. Because Wyatt took out a loan on his home during the tense days of early 1882, the mortgage that was created and recorded is now the proof of where he once lived in Tombstone. During his much storied time in Tombstone, Wyatt Earp’s name has been surfaced on water rights, named in the Epitaph on mining claims, and leases etc, but simply owning all of part of a given piece of land doesn’t prove that you ever lived there. What the mortgage proves is where Wyatt Earp actually lived while in Tombstone, the location that he called home, and it further proves that the place called home by Wyatt while in Tombstone was not on the north side of Fremont Street near the statue of him, as was previously believed by many locally…we now know the exact two lots on the south side of Fremont Street that Tombstone’s most famous ex-resident lived on, and we know from the Fly photo in my collection just how that home appeared. Years ago I purchased a collection of Fly photos of Tombstone from the direct line descendent of a Tombstone miner, who had literally walked into Fly’s gallery and purchased them himself. One of these photos, taken from Tank (Comstock) Hill clearly shows a small home, more humble than Virgil’s and to the west of Virgil’s home, with vacant land visible between the two homes. This is the home of Wyatt and Mattie Earp. I have cropped a portion of that original Fly photo so that after 130 years, Wyatt Earp’s Tombstone abode can now be viewed and enjoyed by the many readers of this site the world over. Kevin Pyles and John Rose standing between lots 4 and 5. Looking South from Fremont Street between lots 3 and 4. The blue cooler marks the dividing line between lots 4 and 5 of block M, where Wyatt and Matties home once was, on the South side of Fremont Street. 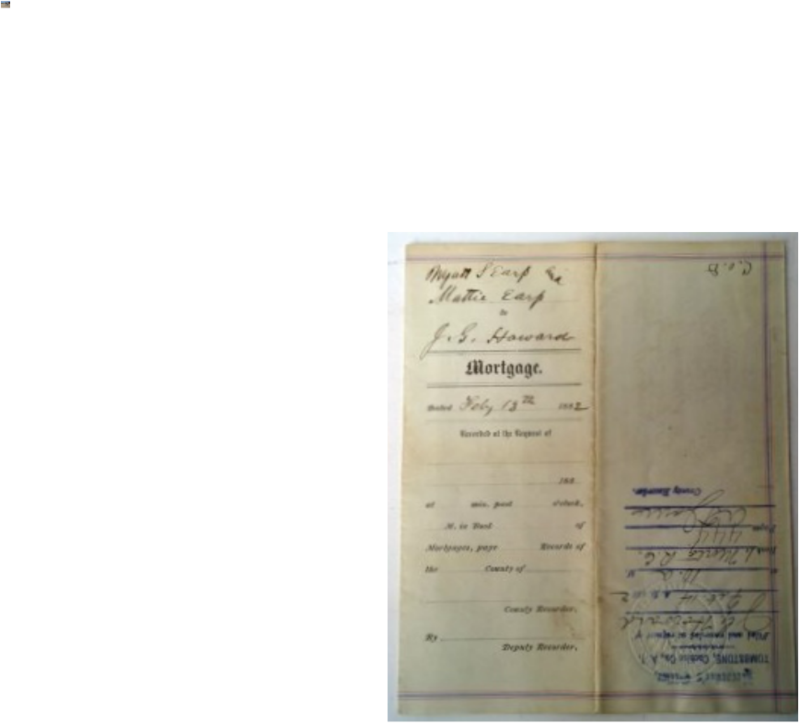 James Howard chose to have the original mortgage (originally drafted by B.L. Peel, local judge and Notary Public) copied in longhand at the County Recorder’s Office by A. T. Jones; thus, this private transaction became a matter of public record. This explains why the handwriting and names in the body of Jones’ document, including Wyatt’s and Mattie’s, are not their signatures, but appear in Jones’ hand. That Howard would have the mortgage recorded was good insurance if the original was ever lost, as the handwritten recorders copy would still offer proof of his loan to Wyatt Earp. From the 1882 Delinquent Tax Roll Cochise Co.